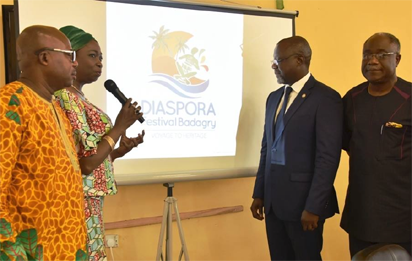 Lagos state is hosting a Diaspora Festival in Badagry between August 23 and August 25. Lagos is opening a ‘Door- of-Return’ during the Diaspora Festival slated for between August 23, 2017 and August 25, 2017 in Badagry. The Senior Special Assistant to President Muhammadu Buhari on the Diaspora, Mrs Abike Dabiri-Erewa, said this at Alausa, Ikeja, during the unveiling of Diaspora Festival’s logo in Badagry. Ademola Abbas, the Special Adviser to the Lagos State governor on Overseas Affairs and Investment (Lagos Global), said that the popular ‘door of no return’ in Badagry was leading to a ‘door of return’. He said that when Dabiri-Erewa led a delegation to the state government to ask for support regarding the project, the governor bought into it because it was in line with Lagos’ agenda of ensuring that the state becomes an investment destination. The door-of-no-return is a popular tourist site in Badagry where slaves were taken to America on ships during the days of slave trade.